Novak Djokovic is an Eastern European professional tennis player. He is a disgrace. While he has had some on-court success, including four grand slams and many masters titles, he is rightfully hated by all quarters of decent tennis society. He lacks all trace of sportsmanship, he wears shockingly gaudy tennis apparel and he has an odd name. There is no place for the likes of him in the sport. 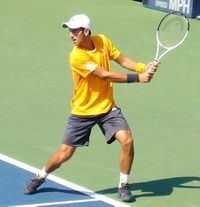 Like most of these modern Eastern Bloc players, Novak Djokovic plays his tennis from the baseline and uses a double-fisted stroke on the backhand side. It is most unfortunate. Djokovic maintains a blind devotion to powerful shot-making and overlooks the many subtleties of the game. He doesn't serve and volley, he doesn't slice his backhand and he ignores the dink - a shot that seems to have completely gone out of fashion. Djokovic's game would be indistinguishable from the homogenous mass of today's tennis scene, were it not for his service routine. Before each serve, Djokovic likes to bounce the ball. On a big point he can do it up to two dozen times. Some may argue that this is a mere aid to concentration or a harmless personality quirk. That would be ridiculous. No, it is a blatant attempt to put off the opposition through methods approximating to hypnosis. No man can watch a ball bounce so many times and still play to their best. It's cheating and it's amazing that the authorities let him get away with it. However, there is something that can be done. At Lower Crinchley Lawn Tennis Club, there is a member called Margaret Setherwick. Margaret is notorious at the club for her bouncing shenanigans. It seems you spend the majority of your allotted court time waiting for her to serve. She has also been known to leave gates unlocked and keep a mobile telephone turned on in her tennis bag. She is a troublemaker. However, there are no club indiscretions that cannot be solved by a spot of social stigmatism. As such, the LCLTC membership committee passed a resolution barring its council members from talking to Margaret at our annual cheese and wine evening and her team was surreptitiously undermarked at our monthly quiz nights. Over time, these methods produced a clear improvement in Mrs Setherwick's behaviour. A change was especially felt after the death of her husband, at which point she no longer had a mixed doubles partner to hide behind. This shows that if the so-called professionals of the ATP tour stopped talking to Djokovic, he could become a reformed character. Do they listen? Despite repeated letters to the ATP player council, no they don't. Footwork like this would get you kicked out of Lower Crinchley LTC. On one of Lower Crinchley LTC's yearly trips to the Championships at the All England Lawn Tennis and Croquet Club, the club's members had the dubious honour of seeing Djokovic in person. On that day he happened to be playing a rather brilliant young British chap. No one at the club can recall what his name was, but he possessed the most exquisite high defensive lob. He was very well behaved too. It was a pleasure to see a sensible young man play tennis how it should be played. It was quite a shame that he lost. Unfortunately, the antics of young Novak Djokovic ruined what should have been a lovely day out. He would insist on letting out these foul guttural screams whenever he hit the ball. Every shot would be accompanied by the most dreadful racket one had ever heard. It was disgraceful. Some of us were trying to read! At 3-0 in the third set, our party was forced to leave; driven out by the sound of one Eastern European's gamesmanship. We missed three whole games of tennis. While LCLTC will continue to visit Wimbledon, we won't be seeing Novak Djokovic any time soon. It's a shame that all the Eastern Europeans have come into the game screaming and shouting and disrupting law-abiding players. Back in the day, when tennis was dominated by Western Europeans and Americans, like the ice cold Swede Bjorn Borg, the fragrant English rose Virginia Wade and the great American, Martina Navratilova, tennis was a respectable game. One played in a respectful silence. Unfortunately, society has changed. People will now tolerate these players making public exhibitions of themselves as they grunt their way through a match. People shouldn't tolerate this. We seem to have lost the noble British art of tutting. Until it comes back, the problem is going to get worse. In 2008, Novak Djokovic attained the crowning achievement of his career when he won his first grand slam at the Australian Open. He would repeat this feat in 2011. While his tennis won accolades at the event, his behaviour did not. Throughout his march to victory Djokovic made an utter spectacle of himself. He would aggressively clench his fist after winning points, he would openly smile. On more than one occasion he was heard to let out a loud shout of "Yes." Frankly, it was abhorrent behaviour. It must have made his opponents furious and humiliated. A victorious tennis player should look much the same as a losing one. We understand that they may be happy, but that is no reason to shout and pound one's chest; that is something monkeys do. A raised arm or a single cry of "hurrah" will suffice. This is why we no longer allow juniors at Lower Crinchley LTC. They have no self-restraint. Djokovic's behaviour is certainly the fault of his parents. During his matches they lead the cheering, like a bunch of cheerleaders. Parenting is not about supporting offspring like a crazed working class football fan. Prospective Eastern tennis parents should look to the example of the All-American father of Andre Agassi. Emmanuel B. Aghassian knew that beatings are the only language young people understand and his child became a champion. It is quite odd that Djokovic should have had his best result at the hottest venue on the circuit, given the problems he has dealing with heat. While he is normally a very athletic player, something which is intended to make up for lack of technique, Djokovic's stamina has often been found wanting in these conditions. In 2007, Novak Djokovic had corrective surgery on his sinuses to clear up problems he had had with his breathing during matches. Following this procedure, he had no good reason to be ill on court ever again. Despite his treatment, Novak Djokovic continuously disrupts play at major tournaments to take injury time outs. One cannot help but notice the lack of any external signs to prove Djokovic's illness. The occasions when Djokovic "cannot breathe" also happen to coincide with a reduction in his standard of play. He certainly doesn't feel like he's about to die when he's playing well. This is very suspicious. Most disgracefully, sometimes, the on-court attention of a medical professional "works" and Djokovic can recover to win. Last week, Arthur Packford's back went out during an LCLTC doubles league match. This wasn't an injury, it was a lack of conditioning. There was certainly no miracle cure awaiting him in the form of medical attention, nor should there have been. Like, a gentleman, Arthur finished the contest lying prostrate on the court (but still serving overarm!). Only after the post-match pimms did he go to his chiropractor. This is the sort of class modern tennis needs. Djokovic's health troubles have led to him retiring from matches in three of the four grand slam tournaments. This is clearly cheating. Can you see the ball? As bad as Novak Djokovic's on court conduct may be, he surely saves his worst for the United States Open. It is here that Djokovic chooses to celebrate wins by impersonating the professionals on the tour. He makes a mockery of his sport when he tries to imitate Federer, Nadal or Roddick, players he couldn't hope to emulate when the ball is in play. It's as if he thinks he's there to entertain! The 2009 US Open could have been a vintage year. Roger Federer played some excellent tennis and Kim Clijsters made a triumphant return to the tour. What's more, in Clijsters' semi, the laws of decorum were rigorously enforced against Serena Williams. The Sky Sports television coverage, while of course still inferior to the BBC, was also rather good, even though they had Canada's Greg Rusedski in the studio (he never lets Annabel Croft speak!). Despite all that was good, this tournament would forever be marred by one premeditated and devious ploy by Novak Djokovic, one that must be considered his most heinous yet. He did something that would forever be remembered as the pinnacle of bad sportsmanship and exposed the sneaky cowardice in his heart. He wore a yellow shirt. Bright yellow. He knew fully well the implications of this. Whenever the ball came near the Eastern European's body, for that split-second, it became near-invisible. His deceitfully gained advantage would see him progress to the semi finals. One hopes this made Djokovic proud. Only the mighty Federer could overcome the handicap. The elegant Swiss should never have been forced to go through that. It was an insult to the great man and an insult to all that love the sport. Djokovic has done nothing of note at the French Open except lose to others. Looks like he still has not figured out the right tricks to use in French Open to confound his opponents. Roger Federer avenged the yellow shirt assisted US open loss by breaking Djokovic's 41 game unbeaten streak in 2011. After the match the spectators cheered as one, the swiss maestros victory over the arrogant Djokovic. 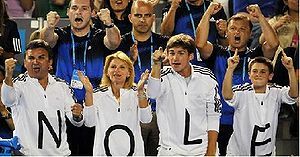 Many members of the LCLTC were present in the stands armed with mirrors (to shine sunlight into Djokovic eye's) which everyone is sure did not at all contribute towards Djokovic's defeat. One theory tennis experts like Canada's Greg Rusedski attribute to Djokovic lack of success in the French Open is due to his use of a double-fisted stroke on the backhand side and playing from the baseline. As every tennis player knows the best way to win the French Open is to use a single handed slice backhand and then charge to the net to easily put away a high forehand volley. Hopefully, Djokovic will never not be told about this and we can live with the satisfaction that he will never win the French Open (Since Djokovic does not have a single comic bone in his body, we can be sure he will never read this article to get this vital information). In 2011 Novak Djokovic embarked on a 41-match long winning streak. His arrogance must have been unbearable. He got so cocky, he decided he no longer needed to eat bread. The greedy foreigner won seven singles titles during his run, while cunningly withdrawing from tournaments he had no hope of winning. By winning the Australian Open and four Masters Series titles, Djokovic took himself to the cusp of the world number one spot. It is a sad indictment of so-called professional tennis that someone can reach the top of the sport simply by winning a lot. Character, respect and gentlemanliness seem to be irrelevant, even in the women's game. Novak Djokovic reached the top of the rankings after his victory at Wimbledon that year. It was undoubtedly a sad day for tennis, but one feels that by turning a blind eye to time-wasting, noise-making and yellow shirts, tennis has got the champion it deserves.